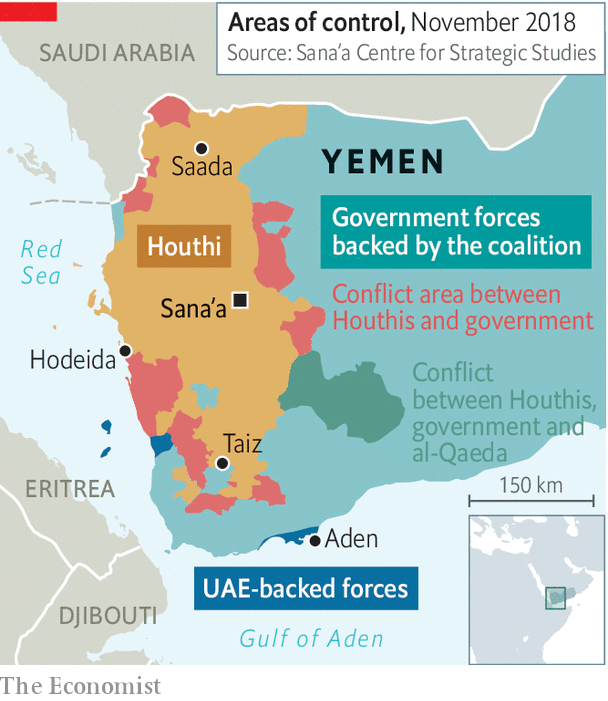 Editor’s note (December 13th 2018): After The Economist went to press the government of Yemen and the Houthi rebels agreed on a ceasefire in Hodeida. This story has been updated to reflect those developments. “HOPE IS THE currency of the mediator,” says Martin Griffiths. If that is so, then the United Nations envoy to war-torn Yemen is spending liberally. As The Economist went to press, Mr Griffiths was wrapping up peace talks in Sweden, claiming progress on several fronts. The Houthi rebels and the government they pushed out in 2015 have agreed to exchange thousands of prisoners. The government and its foreign allies, which control the skies, say they will allow the airport in Sana’a, the rebel-controlled capital, to reopen. And, most important, the two sides have agreed to a ceasefire in Hodeida, Yemen’s main port. The summit itself is an achievement. It has been over two years since the Houthis and the government sat around the same table. It has been four since the war began, drawing in other countries, including a coalition led by Saudi Arabia and the United Arab Emirates (UAE), which backs the government, and Iran, which supports the Houthis from afar. Tens of thousands of people have been killed in the fighting. Millions are at risk of starvation, says the UN. The promise of more talks early in the new year is thus welcome. But big obstacles stand in the way of a lasting peace. They start with Hodeida, which is controlled by the Houthis and has been under attack by forces aligned with the government. An all-out battle for the port, through which most goods and aid flow, risked exacerbating the humanitarian crisis. The ceasefire, it is hoped, will mitigate the suffering. The forces of both parties are meant to withdraw. The city will be placed under the control of locally recruited forces, whose make-up is still unclear, with the UN monitoring the situation. But implementing the deal will be tough given the depth of distrust between the warring parties. There are many who do not want peace. Powerful people on all sides are profiting from the conflict. In this effort, at least, supposed adversaries are working together, says the Sana’a Centre for Strategic Studies, a think-tank. Anti-Houthi commanders inflate the size of their forces to receive extra arms from the coalition. These are then sold to the Houthis. The import of cheap fuel from Iran seems to benefit only bigwigs who oversee or approve shipments. By the time it gets to the local market, the price has been marked up. “Without reining in the influence of the war profiteers, the chances of achieving peace are grim,” says the centre. International pressure to end the war is growing. Much of it is coming from America and directed at Saudi Arabia. The United States Senate looks likely soon to pass a resolution withdrawing American support for the coalition. President Donald Trump, who is cosy with the kingdom, will have the final say. But Saudi influence in Washington has waned since the killing in October of Jamal Khashoggi, a Saudi journalist, in the kingdom’s consulate in Istanbul. Shortly afterwards, America ended in-flight refuelling for coalition aircraft in Yemen and called for peace talks. Saudi Arabia gets much of the blame for Yemen’s misery. It has bombed civilians and the government it supports is not popular. 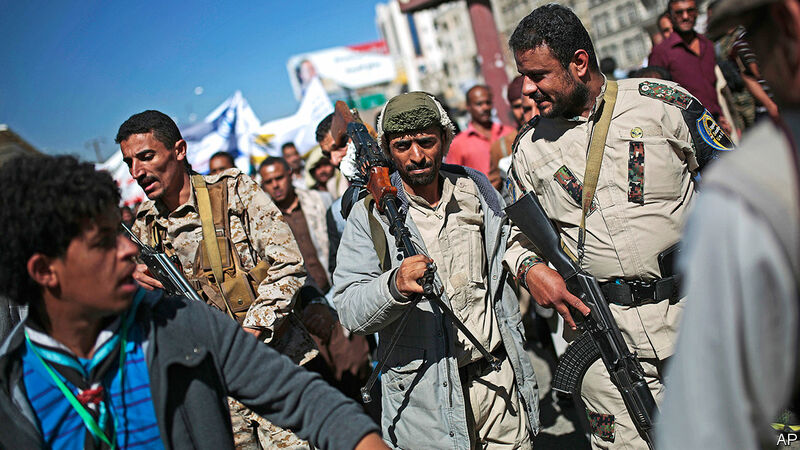 The Houthis, though, are also widely hated. They have been accused of torturing prisoners and running a police state. Many Yemenis, therefore, do not care who wins. But ending the fighting would just be a start. A political solution that assuages everyone’s grievances will take time. For now, there is only hope. This article appeared in the Middle East and Africa section of the print edition under the headline "Look who’s talking"